Trending at $5.09eBay determines this price through a machine learned model of the product's sale prices within the last 90 days. Title: Saved By The Bell: The Complete Collection. Format: DVD. Region: DVD: 1 (US, Canada.). All dvd box sets are playable anywhere in the good ole USA. This is kind of a strange set. So, this set is missing 3 episodes of theCollege Years but has adouble feature DVD instead. Missing Season 3 Disc 1 and also missing Season 4 Disc 4. Trending at $4.61eBay determines this price through a machine learned model of the product's sale prices within the last 90 days. In spite of these anomalies, we have attempted to present the episodes in airing order with the notable exception of the Malibu Sands story arc, which is presented in sequence here at the end of Season Three, in order to best serve the viewing experience for fans. Discs play fine but have noticeable scratches, and the third plastic disc holder in the case is partially broken and doesn't hold the disc in place as tightly. ISBN/UPC: 031398216858. Condition: Very Good. Saved by the Bell: The Complete Collection. Author/Artist: Saved By the Bell. Condition: Very Good. Notes: Item in very good condition! The adventures and the laughs never end at Bayside High, Southern California's coolest school. Saved By The Bell. The New Class Season 1. Format: DVD Full Screen. Product Release Date: 2005. Trending at $15.31eBay determines this price through a machine learned model of the product's sale prices within the last 90 days. The case has wear, creasing and tear. Stickers and/or sticker residue on the case. The disc shows some wear from normal use. Disc(s) may have been cleaned/resurfaced prior to shipping. This item has not been tested. Ships Monday through Friday from Ohio via USPS. We are a non-profit whose mission is to help individuals prepare for, find and retain employment. Battery does not work at all, the item will be listed as "dead battery.”. the one shown in the photo. the item you will receive. If you require. Trending at $25.63eBay determines this price through a machine learned model of the product's sale prices within the last 90 days. The Unauthorized Saved by the Bell Story (DVD Digital) TheUnauthorized Saved by the Bell Story follows six young, unknown actors thrust into the Hollywood spotlight and exposed to the challenges of growing up under public scrutiny. Box has several imperfections. DVDs are in excellent used condition. Title: The Unauthorized Saved by the Bell Story. Format: DVD. Region: DVD: 1 (US, Canada.). Starring Dylan Everett, Sam Kindseth, Kendall Cross. Original Year: 2014. Saved By The Bellhas been quoted as "The Be st TV Series ever", and has continued to thrill fans old and young each season with its fun story lines centered around characters you haven't seen on hundreds of other shows. Title : Saved by the Bell - Seasons 1 & 2. The item may have present signs of previous use, and the cover may have wear/markings on it. The item also includes the original artwork. CASE: GOOD, SMALL PIECE HAS BROKEN OFF (REFER TO PICTURE). CDs are new but the case cd holder is broken. 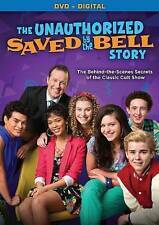 -NEW- Saved by the Bell: The New Class Complete Series DVD Seasons 1,2,3,4,5,6,7. Condition is Brand New and Sealed! Saiyuki - Vol. 11: Following the Scriptures (DVD, 2004) NEW SEALED! Saved By The Bell Seasons 1 & 2 DVD 4-piece Set MISSING DISC 5 Original Classic 1989-1990 TV Series starring all your favorite Bayside crew. Wild ride. Gently used in excellent condition overall with light to minimal outer surface wear. Screech is the class clown and electronic genius, and fashion conscience Lis a is mostly occupied with expanding her wardrobe. Jessie is the neutralizing force, often trying to convince the gang to do the rig ht thing all while school principal Mr. Belding is continuously trying to connect with the younger generation. Saved by the Bell: The Complete Collection (DVD, 2013, 13-Disc Set). Condition is Good. Shipped with USPS Media Mail. Title: Saved by the Bell - Seasons 3 & 4. If applicable: Digital copy or ultraviolet codes may be expired, used, or not included. Condition: Used - Good. THIS LOT INCLUDES SAVED BY THE BELL SEASONS 1,2,3,4,5 PLUS A DOUBLE FEATRE DVD THAT INCLUDES "WEDDING IN LAS VEGAS" AND "HAWAIIAN STYLE". You are bidding on Saved By the Bell Seasons 1, 2, 3 & 4 on 9 DVDs. DVDs have light scratches which don't effect playback. Cases are a little rough as they have rips and other wear. See photos of actual item for details. All of them viewed once and sat on my shelf since.